Great British Bake Off finalist, and author, James Morton, showed his support for this year’s Scottish Learning Disability Week by coming along to a ‘Communi-tea’ event. 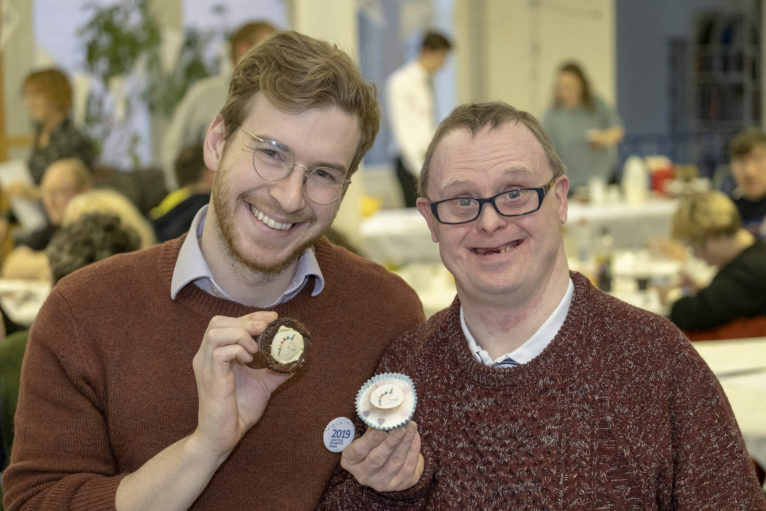 The ‘Communi-tea’ event was for people with learning disabilities and their supporters to come together to enjoy some home baking and play a variety of tea party – themed games. James has also written a recipe in honour of Learning Disability Week, which was baked by some of the SCLD team to celebrate the launch of the ‘Get Involved’ packs at the ‘Communi-tea’. The ‘Get Involved’ packs will help people run their own events during Learning Disability Week, which takes place between Monday 13th – Sunday 19th May. The Communi-tea event is part of this year’s Scottish Learning Disability Week theme, ‘Community’, and was held at Project Ability, a visual arts charity and gallery, which supports people with learning disabilities. This year’s Learning Disability Week seeks to highlight the way that people with learning disabilities are making a contribution to their local community, and also to draw attention to the barriers that can sometimes stop them from doing so. The week takes place between Monday 13th – Sunday 19th May, culminating in Scotland’s Learning Disability Awards, which take place on Friday 17th May. You can have a go at baking James’s special Learning Disability Week recipe here. Pictured above: James Morton (left) alongside Stephen Dickson, who designed the Scottish Learning Disability Week mascot ‘Uno the Unicorn’. Pic by Peter Devlin.